As soon as I can get my hands on fresh berries in the spring, I start incorporating them into everything from muffins to tarts. While frozen berries can (and do) have as much flavor as their fresh counterparts, fresh berries have more texture and that makes them a bit easier to work with. 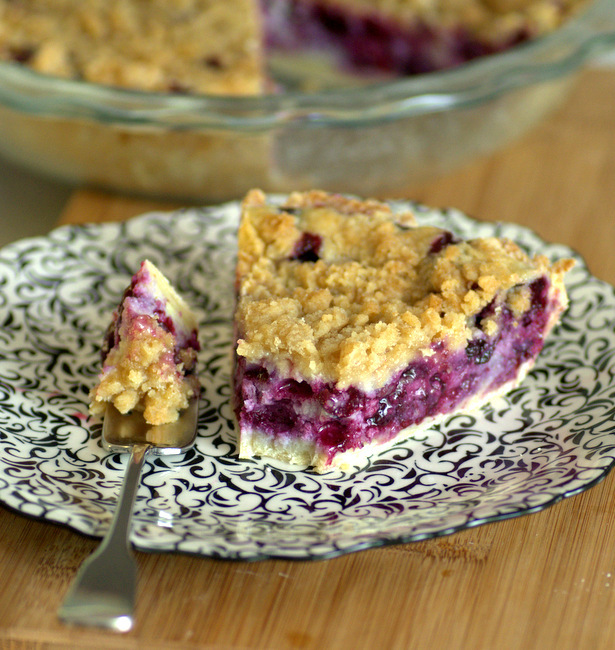 This Lemon Blueberry Ricotta Pie is a wonderful example of a dessert where fresh berries make a difference. The berries hold their shape during baking and, though there are a lot of berries in every slice, the berries are still distinct from the ricotta custard that surrounds them. The result is a pie with a lot of texture and a lot of flavor that is perfect for springtime entertaining. 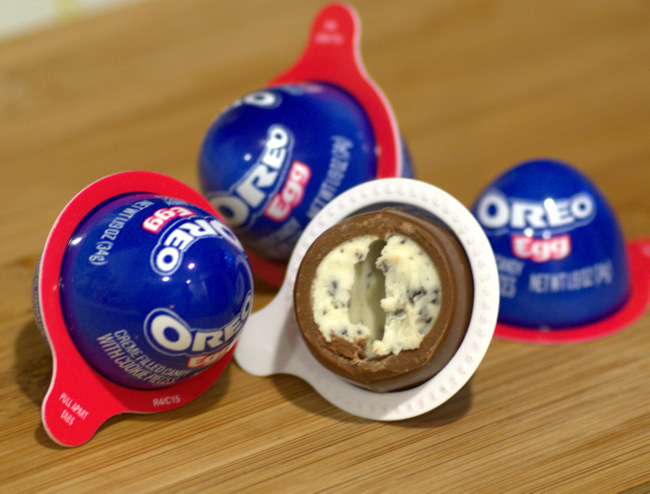 The filling is very simple and only requires a few ingredients. Ricotta cheese makes up most of the base, lending a slightly tangy note and a cheesecake-like texture to the blueberry-packed pie. I added both lemon zest and vanilla extract to the mix, giving the pie a citrusy twist that contrasts well with the jammy berries. The custard is topped with a streusel mixture that gives the creamy filling a bit of crunch and adds a little more sweetness to the mix. 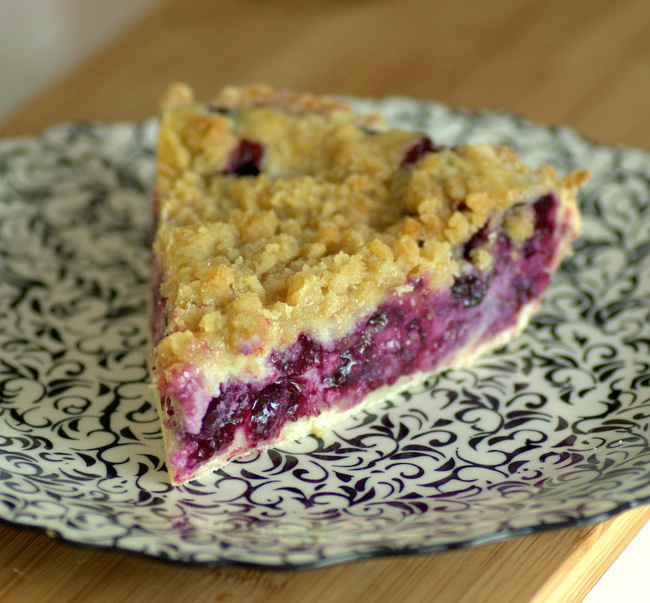 Frankly, streusel makes any dessert more addictive and this pie is no exception. The crust is unbaked when the filling goes in for this recipe. The pie requires a short period at a high temperature, followed by a long period of baking at a low temperature. The crust should bake up nicely in this time. That being said, some store-bought pie crust doughs are a little bit thicker than homemade crusts, so don’t hesitate to roll out your crust to make it a touch thinner if you’re worried that it won’t bake in time. The filling, though it is a custard, is not overly wet when it goes into the pie filling, which is less likely to lead to a soggy bottom crust during baking. The pie is best when it has been chilled after baking, so be sure to allow plenty of time to refrigerate the pie before you intend to serve it. The pie keeps extremely well for several days after baking, but it has such a light texture that you’ll probably cut it into generous slices and find that you eat your way through it quickly! In a small bowl, make the crumble. Stir together all dry ingredients, then cut the butter in using a fork until mixture is sandy and no large piece of butter remain. Pick up the crumble mixture and squeeze it in your hand to form small clumps, repeating until streusel appears to have a much coarser texture. Set aside. In a medium bowl, whisk together ricotta cheese, sugar and cornstarch until well combined. Whisk in eggs, one at a time, followed by vanilla extract and salt. Fold in blueberries and lemon zest. Bake for 10 minutes at 400F, then turn the oven temperature down (without opening the oven) to 350F and bake for 45-50 minutes, until the crust and crumble topping are golden brown and the custard is set when you gently shake the pan. 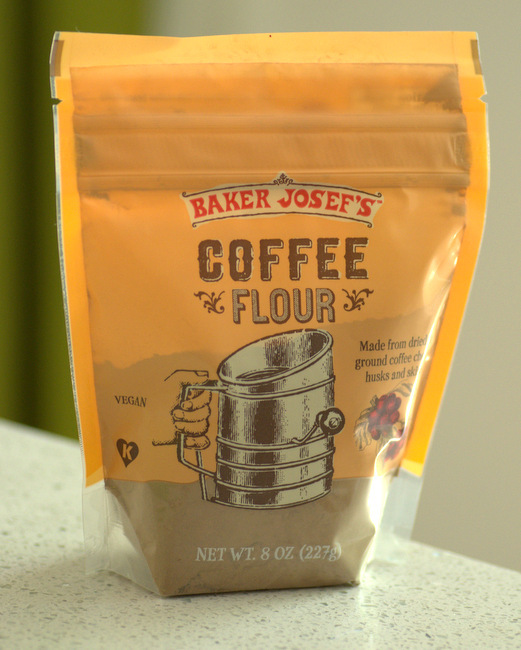 Next PostNext What is Coffee Flour? It turned out very tasty, and not too rich. It looks fab too.